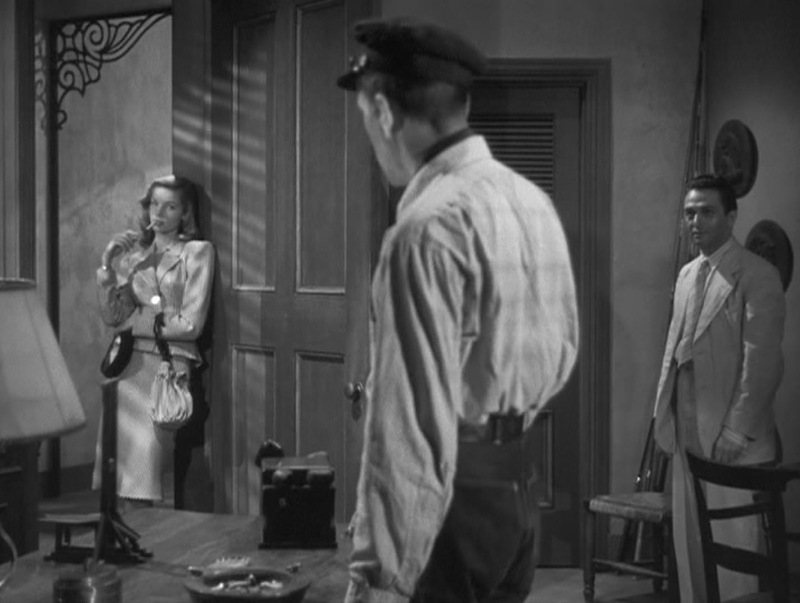 Bogie and Bacall had first met 14 years earlier when she was making her debut in To Have and Have Not, an adaptation of what director Howard Hawks considered to be the worst of Ernest Hemingway’s novels that would translate to the screen as a war romance full of wit, style, and intrigue in the tradition of Casablanca, the film that had cemented Bogart’s stardom two years earlier. Hawks and Hemingway worked on the script together with additional screenplay development from Jules Furthman and William Faulkner, despite the latter being Hemingway’s literary rival. 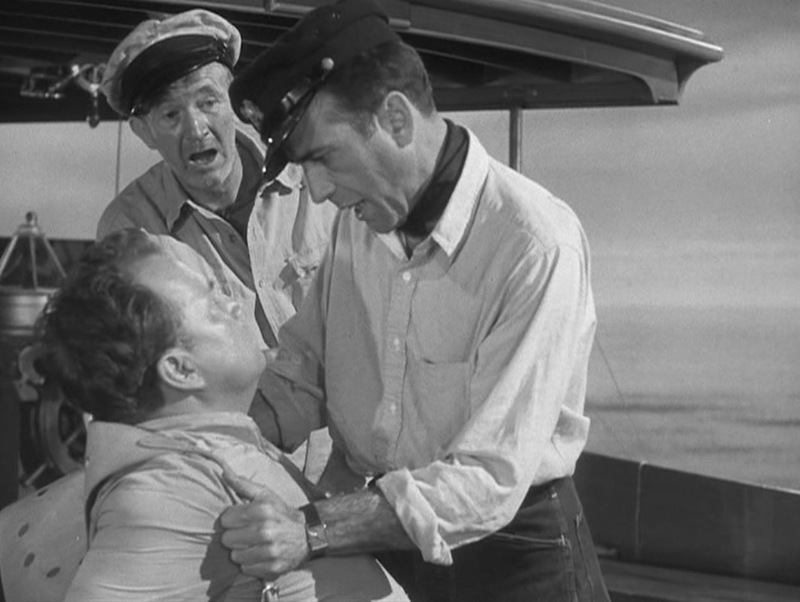 Ultimately, much of the film’s dialogue was a blend of contributions from these four and improvisation by its talented cast, led by the unexpected chemistry of the 19-year-old ingenue Betty Bacall and the 44-year-old Bogie who was on his third, and least happy, marriage. Despite the implications of the generational age difference and the cliche of the experienced actor/attractive young leading lady affair, the intense attraction was mutual between the two stars in what would be Bogie’s first, and last, romance with one of his leading ladies. Despite Hawks disapproving of the romance (some say out of jealousy), the two developed an affectionate relationship based on mutual respect as Bogart served as a supportive mentor for the young actress in her first role, putting Bacall at ease and giving her the confidence to overcome anxiety and perform at her best. 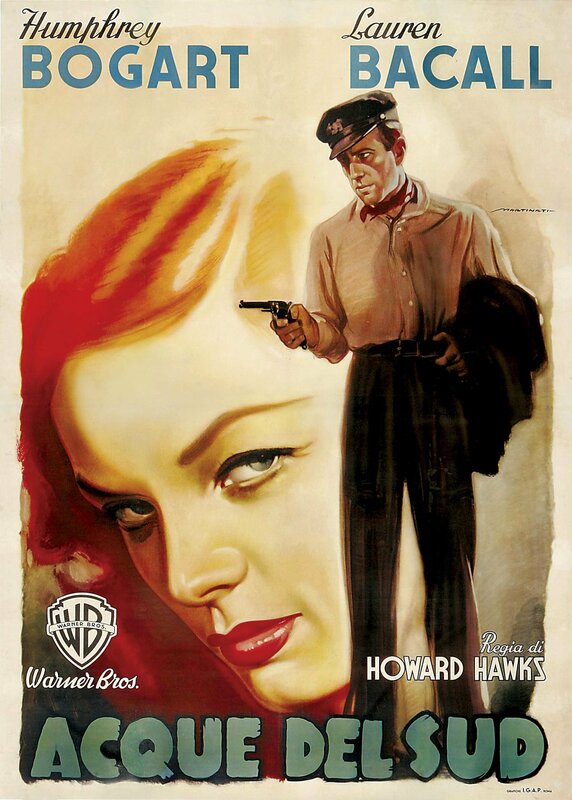 Hawks’s portrayal of Morgan’s relationship with a woman… constitutes the single greatest change between the novel and film version of To Have and Have Not. 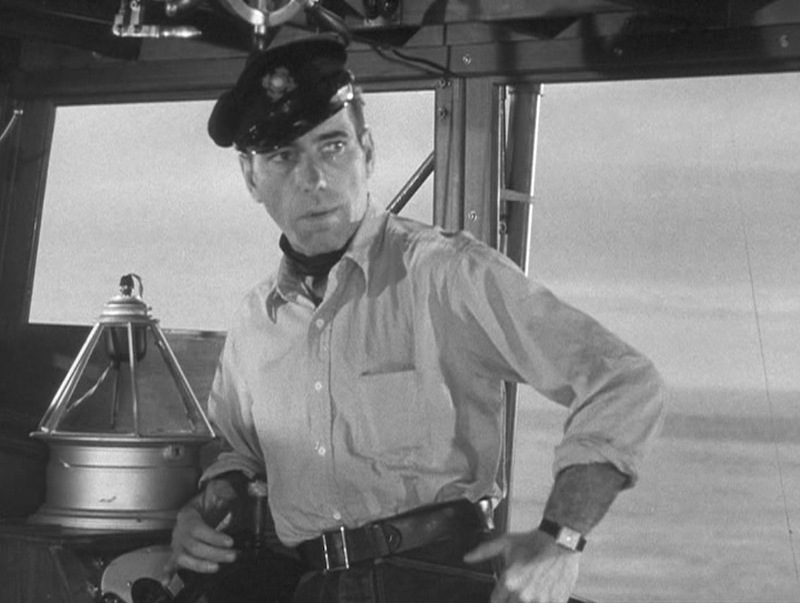 Morgan’s behavior ranges from simply not turning her in for pick-pocketing a drunk at the beginning of the movie, to buying her a plane ticket off the island in the middle of the movie, and culminates with his risking his life, ostensibly so that he will be able to spend the rest of his life with her. Immeasurably assisted by the fact that Bogart and Bacall fell in love on the set, the film was above all else a love story. 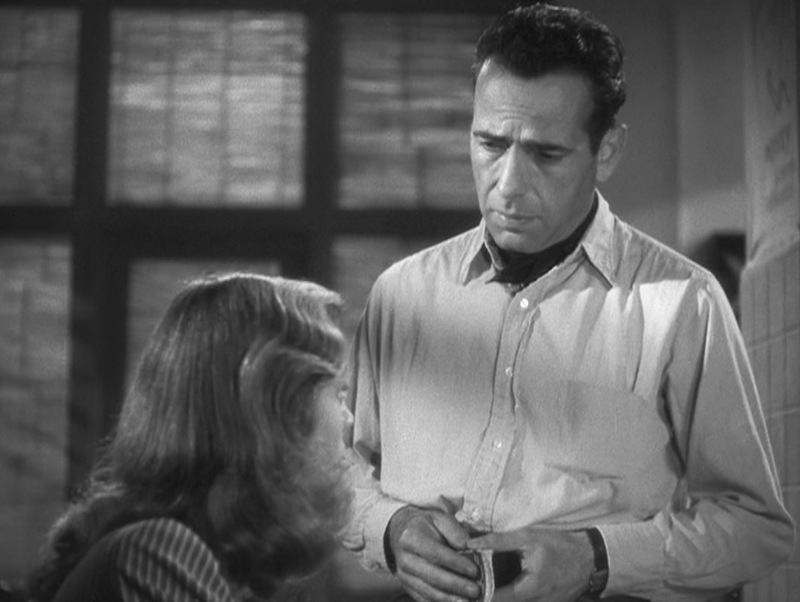 Bogie and Bacall make their first cinematic contact and the screen sizzles. Given the endurance of the legendary Hollywood romance that began on the set of To Have and Have Not, I consider it a good sign that this was the first movie that my girlfriend and I ever watched together. 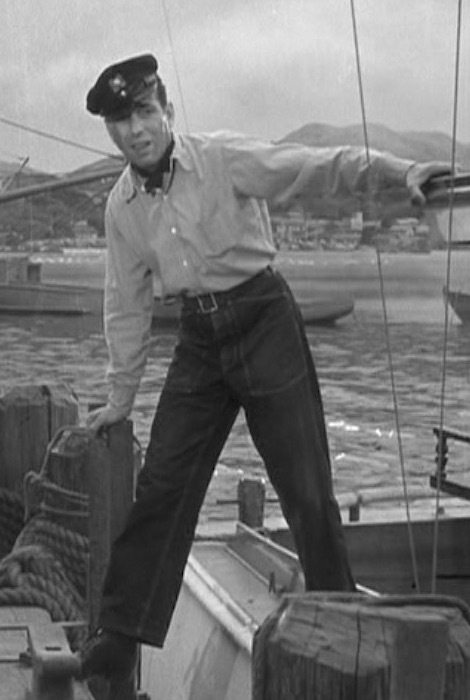 Humphrey Bogart’s wardrobe as Captain Morgan in To Have and Have Not consists solely of two outfits, both maritime in their form and function: a “dressed-up” navy double-breasted blazer with white gabardine slacks and a “dressed-down” wrinkled work shirt with peaked cap and dark jeans. Harry signifies his position as captain with a traditional peaked cap. The hat has a dark navy canvas cover with a badge of two gold embroidered anchors, crossed, a black leather band across the front, and a black leather visor that shields his eyes from the summer sun. Harry’s neckerchief is no more than a thick single strip of dark cotton tied around his neck, under his shirt collar, to catch sweat. Harry wears a very wrinkled shirt of a light-colored cotton (for the sake of argument, let’s call it white though it could be a pale blue or khaki) that likely never sees nor has any practical need for an iron. It does not appear to be the same as the smoother shirt that he wears with his blazer which has more rounded cuff edges as opposed to the squared single-button cuffs on this shirt. This shirt has a point collar and a front placket that he wears unbuttoned at the top only, revealing the dark neckerchief around his neck. 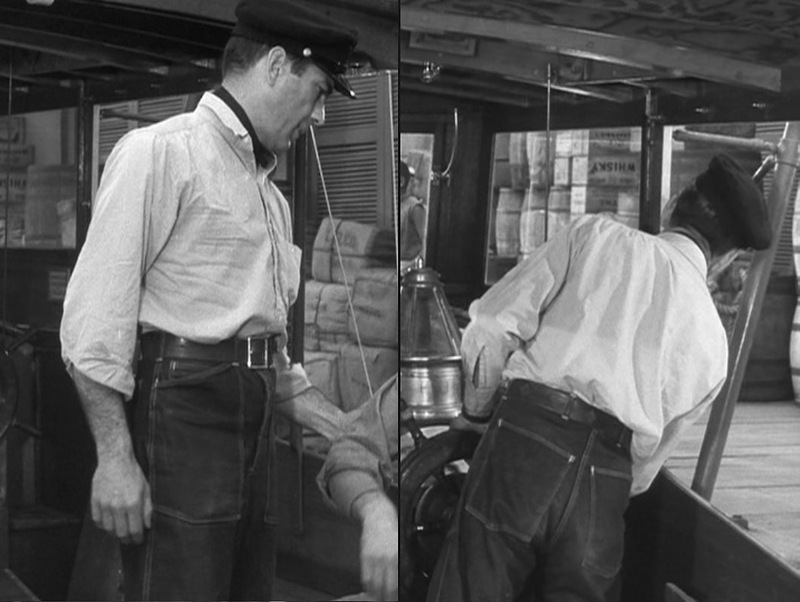 It is shirred across the back yoke and has a front pocket on the left breast for Harry’s trusty packs of Chesterfields. Harry Morgan appears to regret wearing a desperately wrinkled shirt that smells faintly of fish when meeting a woman he’d like to spend the rest of his life with, but c’est la vie. Through the tall belt loops of his jeans, Harry wears a broad dark leather belt with debossed diamond shapes imprinted along the back. The belt fastens through a large squared single-prong buckle in a dulled metal, either steel or brass. 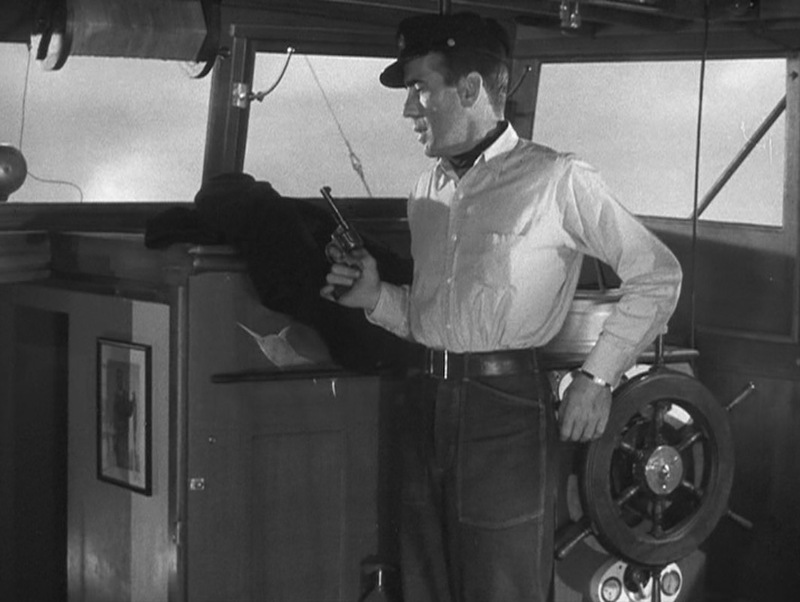 In some scenes at sea, Harry holsters a large knife to the right side of his belt. Harry hikes up his belt before heading out to sea. Harry’s dark denim jeans are unlike anything you’d typically find retailed today. They have a long rise with a fittingly long button fly, six tall belt loops around the waist, and no cinching back strap unlike many jeans of the era. The fit is full and straight through the legs. Designed to be practical for the garment’s original purpose as workwear, Harry’s jeans have massive patch pockets on the front and back with a small coin pocket on the right side; the contrast stitching on all seams shows exactly how big these pockets are. The front pockets have gently slanted frogmouth-style openings that begin just below the most forward belt loop and slant back to about an inch below the next belt loop. Note the debossed diamond shapes along the back of Harry’s belt. The most incongruous element of Harry’s maritime workwear is his choice of footwear… a pair of surprisingly formal dark leather cap-toe oxford shoes which would look more at home with a business suit or even a dinner jacket rather than a wrinkled work shirt and jeans. Harry must have his reasons, however. His socks are a shade lighter than his shoes, possibly navy to match the dark blue denim of his jeans though gray and brown are also viable options. 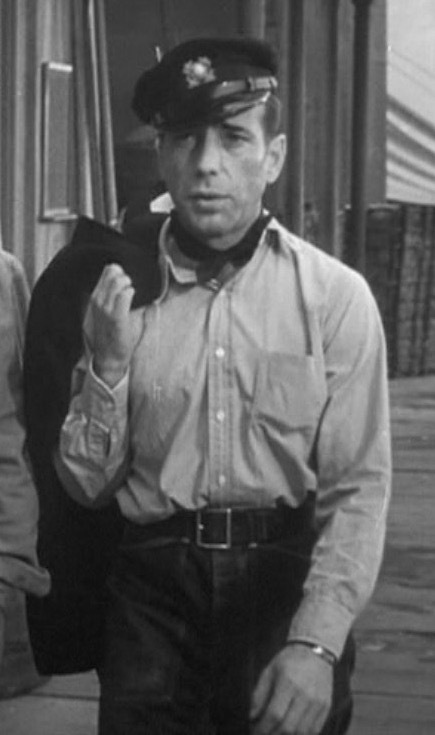 In To Have and Have Not and many other of his films, Humphrey Bogart wears a simple but elegant square-cased wristwatch on a brown leather strap that may have been a personal watch, though it doesn’t appear to have the tonneau-shaped case of his Longines Evidenza. Captain Morgan has had just about enough of the pompous blowhard Johnson. During their covert evening mission to smuggle the Free French resistance members, Harry digs out a coat for Eddie and dons the heavy wool reefer jacket that he’d been carrying around but hadn’t worn until this point. The reefer jacket, more commonly known in its traditional style as a “pea coat”, is a classic maritime outerwear garment dating back to the 18th century. Unlike the traditional pea coat with its high-buttoning front, Harry’s reefer jacket has only four dark plastic buttons in a square 4×2-button double-breasted formation with wide notch lapels. Otherwise, its set-in sleeves, plain cuffs, and straight side pockets are consistent with the classic pea jacket design. 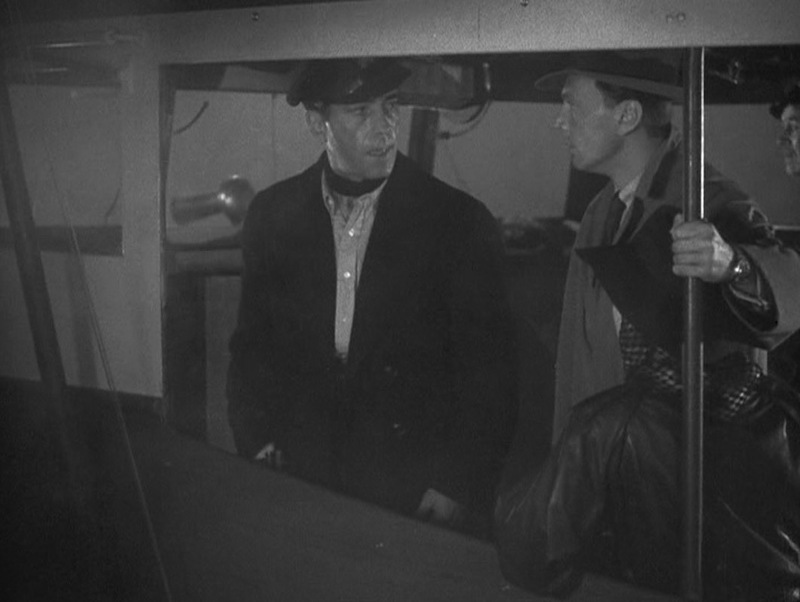 High-ranking member of the French Resistance or not, on Harry’s boat, Harry’s the captain so sit down, shut up, and listen, M. de Bursac (Walter Surovy). 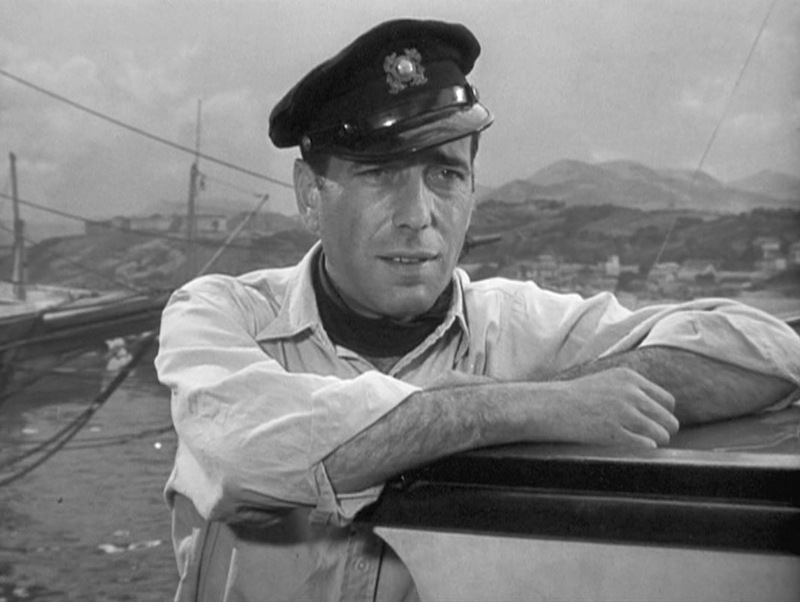 Interestingly, Bogart does not wear his trademark gold ring with its diamond-and-rubies setting that he wears in many of his other films. 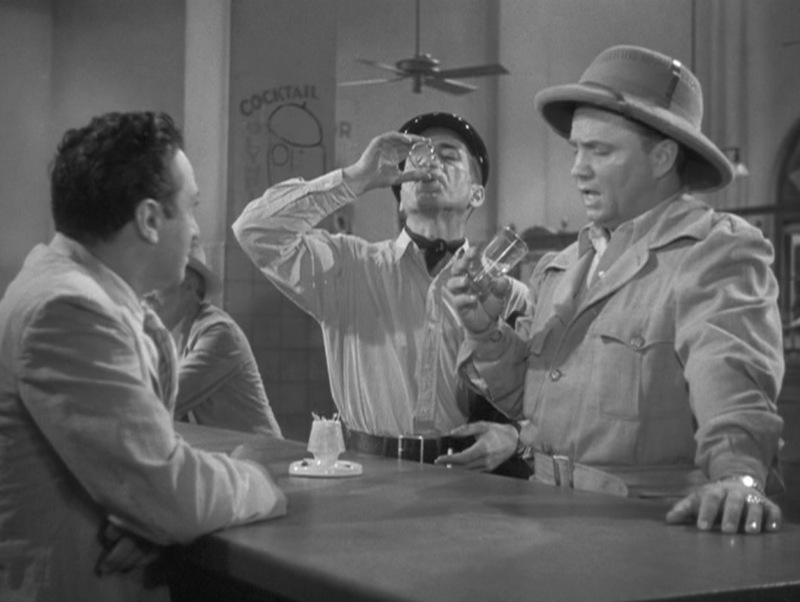 Harry’s client, the blowhard American tourist Johnson, can’t shake his taste for American whiskey, and he orders a shot of bourbon when accompanying Harry to the Hotel Marquis. “When in the Caribbean…” is more to Harry’s taste, and he orders a shot of rum, downing it in one gulp. The Hotel Marquis curiously offers up its shots in highball glasses. Harry seems more enthusiastic about his than the quizzical Johnson. Rather than the original spiced rum which was introduced to the U.S. in 1984 and has since fallen almost exclusively into the domain of college freshmen, the Captain Morgan brand offers a more premium variety that may be more fitting the adventurous spirit of Humphrey Bogart’s character. Captain Morgan Private Stock is a smooth, full-bodied offering that blends deluxe Puerto Rican rums and island spices for a refreshingly more sophisticated experience. Harry: Eddie, what would you do if somebody shot at ya? Eddie: Shot at me? With a gun? (laughs, then…) Who’s gonna shoot at me? Harry: If you’re lucky, nobody… aren’t ya glad ya came? 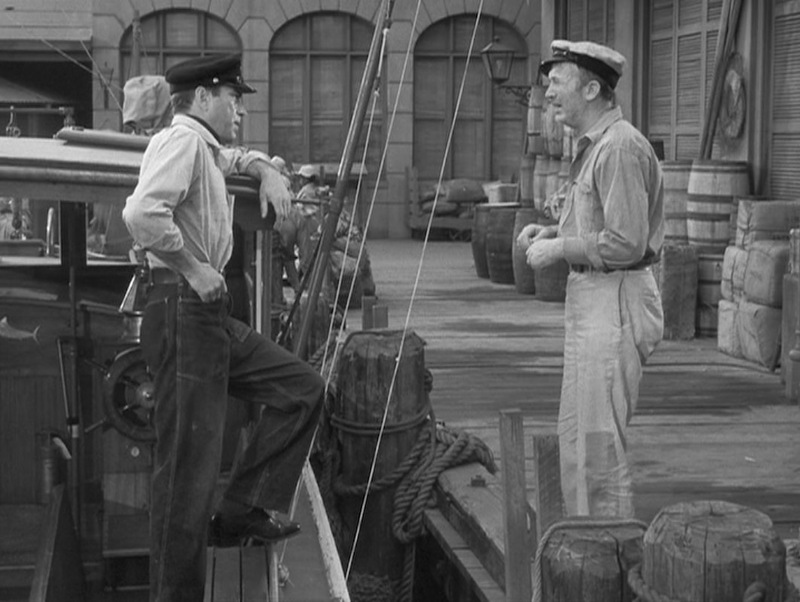 Captain Harry Morgan doesn’t anticipate much in the way of danger when chartering his fishing boat to rich Americans hungry to reel in their catch of the day. But when he’s tasked with smuggling resistance fighters desperately wanted by the brutal Vichy regime, he thoughtfully arms himself with the humble artillery he keeps aboard the Queen Conch. Harry’s sidearm is a blue polished steel Colt revolver, likely a Colt Police Positive based on the smaller frame and the pre-1927 hard plastic grips best seen when Lauren Bacall’s character opens his desk drawer during the film’s climax. Apropos its name, the Police Positive was a standard sidearm for American law enforcement during the first half of the 20th century and was chambered for a variety of .32- and .38-caliber cartridges including the venerable .38 Special. Harry draws his Colt Police Positive at the sound of a stowaway on board. In the book, the circumstances could have been even more dire for the blissfully unaware Eddie. As the night falls and he knows some distance combat might be in store, he digs out a Winchester Model 1892 lever-action carbine from his ship’s chest. Harry: You know how to handle one of these? Eddie: ‘Course I know how to handle one! Everybody knows how to handle a gun. All you do is work the lever and pull the trigger, you know I know that! 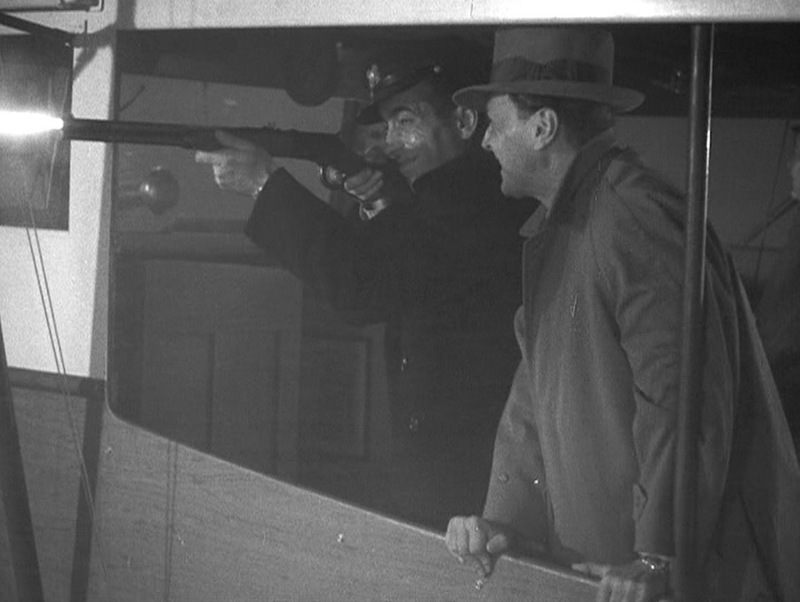 Although Eddie (Walter Brennan) handles the rifle when the Queen Conch takes on her two furtive fugitives, it is ultimately Harry himself who uses it when in battle with the Vichy naval forces, opting to shoot out the combatant’s lights which allows the Queen Conch to make its hasty getaway under the cover of darkness. 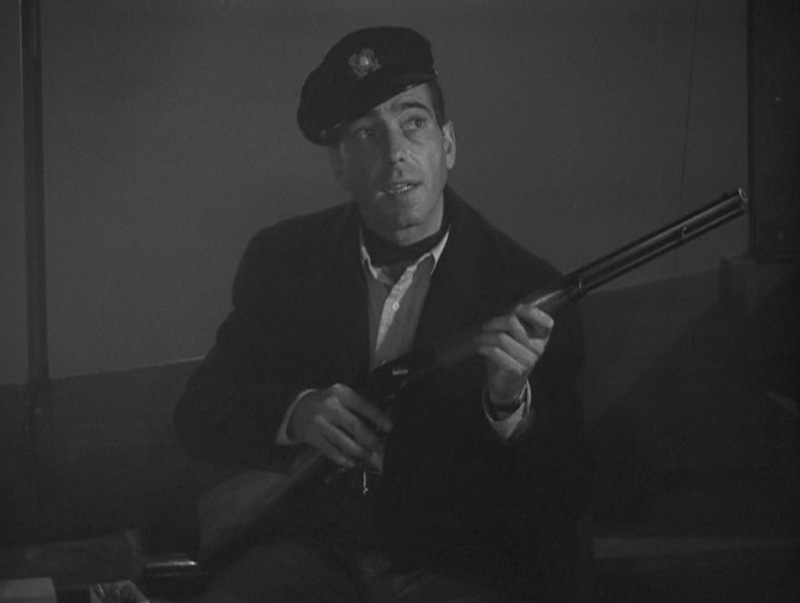 The Winchester rifle earned its reputation as “the gun that won the west”, but Harry Morgan deftly uses it to the French West Indies as well. Both are realistic, reliable, and rugged weapons that Harry would have been easily familiar with and would have had considerable access to rather than more potentially effective weapons like a Thompson submachine gun. Harry understands his limitations and uses the Winchester to the best of his ability, firing just enough shots needed to blind his enemy and neutralize the threat in order to safely make a getaway. 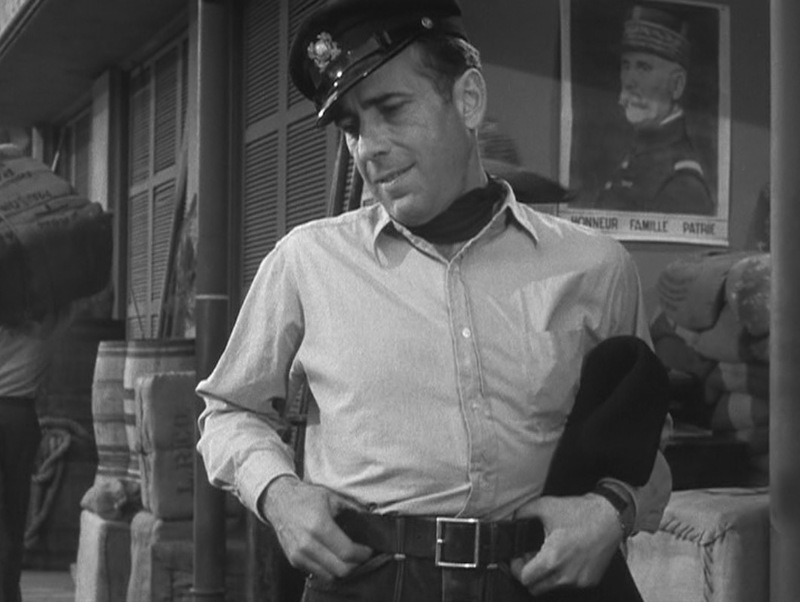 The Italian poster for To Have and Have Not changes the title to Acque del sud (“Southern Waters”) and features Bogie in his character’s dressed-down work shirt, dark jeans, and peaked cap. I know where you stand and what your sympathies are. It’s all right for you, but I don’t want any part of it. If I’m caught fooling with you fellas, my goose’ll be cooked.